If you are going to be operating any kind of manufacturing equipment (like a lathe or mill) in your garage, then you are bound to need to produce three phase power. As I found out when I was looking into getting a lathe, there are many methods in turning singe phase power into 3 phase power. A static phase converter is probably the worst way to generate 3 phase power. This is because a static phase convert doesn’t generate the 3’rd leg. Basically, a static phase converter jumpstarts the three phase motor then lets it run on single phase power. Some static phase converters can inject current into the 3rd leg, but it’s still not a very good converter. The problem with the motor not receiving the 3rd leg is that the motor can only run a 2/3rds of the rated power. So, the complete opposite of that is a VFD (variable frequency drive). 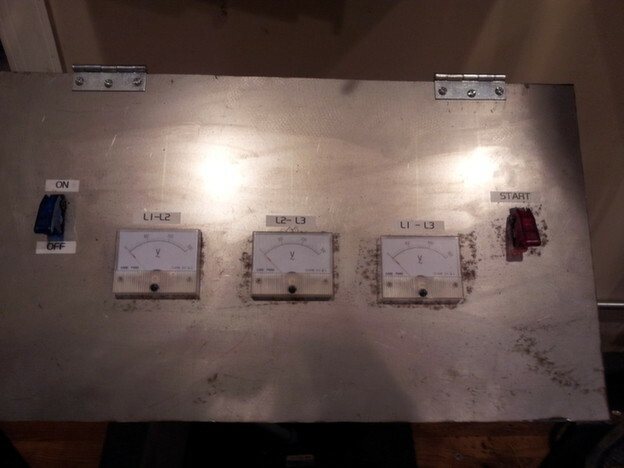 It is a device that is used to control the speed of a 3 phase motor. These devices can generate the 3rd leg if it is not there. These devices will produce perfect 3 phase power. They do this by converting the ac voltage to dc voltage. Then it generates pure 3 phase power. While these devices aren’t super expensive, you must have the unit connected directly to the motor. This means that if you have more than one motor, you will need a vfd per motor. I however chose to use the rotary phase convertor. This type can be tied into a circuit panel and run multiple motors. It can also be built fairly cheaply. A rotary phase converter uses a 3 phase motor (often called the idler motor) to generate the 3rd leg. 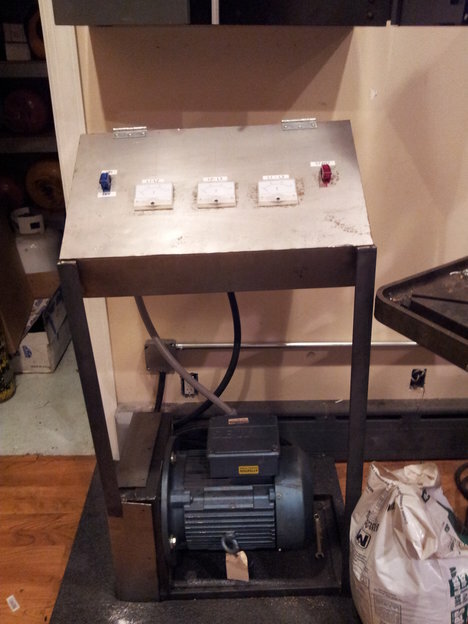 All that is needed is to get this idler motor running, then you have 3 phase power. There are a couple of ways to get this idler motor started. Probably; the most dangerous way to get the idler motor spinning is to use a pull string or to kick the shaft of the motor. Some people also use little motors to get the idler motor running. But the best method is to use starting capacitor. When the idler motor needs to be started, the capacitor will go between T1 and T3 on the idler motor. Idler motor sizing can be a bit confusing. First find out how many motors you want to run at once. The motor needs to be at least as big as this number. So if you have a 3hp motor and two 1hp motors, then you will need at least 5hp idler motor. But this doesn’t take into account starting amps. The idler motor should be 20%-30% higher than the largest motor. So if you are only starting the one motor at a time, you would need at least 3.6hp. Unless you wanted to start all of the motors at once, then you would need at least 6hp because you are starting 5hp worth of motors. But, to get more confusing, you can use a smaller motor to jumpstart bigger motors. So technically, you could use a 3hp idler motor; start one of the 1hp motors, then start the 3hp motor. The 1hp will act as another 3 phase convertor. Now that you got the size of the idler motor you can figure the size of the starting capacitors. You should use 50-100 microfarad per rated hp of the idler motor, and the type of capacitor should be starting capacitors. If you need more capacitance, you can use more than one capacitor, if you wire the capacitors in parallel. Since we’re talking about capacitors, let’s talk about running capacitors. To keep the voltages even on all phases, you can attach running capacitors. You only need about 12-16 microfarads per horse power. You can use multiple capacitors, just like the starting capacitors. For these capacitors, you should use running capacitors. DO NOT USE STARTING CAPACITORS FOR THIS PURPOSE. They will explode from the heat. These capacitors go from T1-T3 and T2-T3. To get the best results, the capacitance needs to be adjusted until the voltages between T1-T2, T1-T3, and T2-T3 as close together as possible while under load. Enough theory, let’s look at my rotary phase converter. Yes, I did watch too much Star Trek as a kid. Now I just need someone called Scotty to man it. 🙂 Anyway; let’s first look at the motor. It used to be a gear motor, hence the face mount. I saw this motor when I was picking up my lathe. It was only a $100 and it is a 10hp motor. These types of weird motors make great idler motors. There cheap because you usually can’t use them for anything else. I got mine at hgrinc.com, but you could also look at surpluscenter.com. I found that when I start my lathe, which is a 5hp motor, it draws around 20 amps from the phase converter. Now, what’s up with that top panel? Obviously, I got the on switch to the left, and the start switch on the right, but what are those indicators in the center? These show the voltages across the T1-T2, T1-T3, and T2-T3 lines. This shows me if the idler motor is out of balance (remember those running capacitors?). Do not try to measure line to ground voltage. My dad (who runs a hvac company) and I had an argument about this. When he works on 3 phase equipment, he would measure line to ground to see if the equipment is receiving proper voltage. This works for L1 and L2, but does not work for L3. You will measure 220 volt, unlike L1 to ground which would be 120 volt. Remember; this is a motor, not a transformer. They have different wiring. Yea, that’s some messy wiring. Now I made most of this with stuff I had laying around. The running capacitors (to the left) are a type of multi capacity capacitor. My dad hates these because they tend to overheat and blow up, well leak. So I saved them from the trash and used them in this. 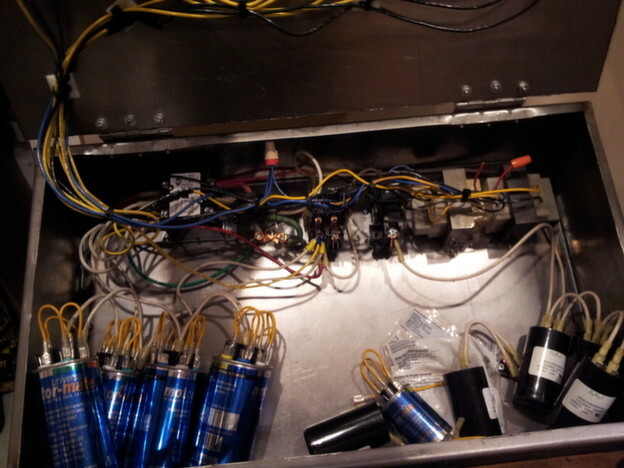 To the right are the starting capacitors. I bought these at temcoindustrialpower.com. Now at the top left is the running relay (sorry, contact, even though that’s a stupid distinction). Top right are two 24 volt transformers. One for the starting relay and one for the running relay. And in the center are two starting relays. I was trying to make it so that the running relay won’t start until the starting switch is fired. Unfortunately, the running relay doesn’t have an auxiliary relay, so it didn’t work. This whole setup could be made simpler if I were to use 220 volt relays.